A wet room uses a bathroom model to allow the entirety of the room to be exposed to water without structural damages. 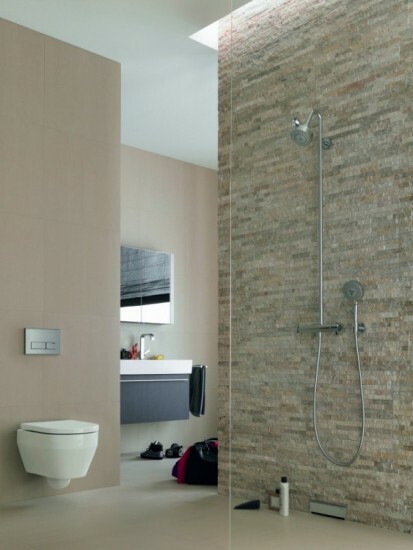 While typical bathrooms feature a shower or bathing area in which the water is entirely contained, a wet room expands the water-proof walls and flooring to the entire room to allow water to be used freely throughout the space. One of the main benefits of having a wet room is its ability to maximize small spaces. Wet room designs can offer an efficient answer to limited space problems. It seeks to turn the entire room into usable space, even with the inclusion of typical bathroom elements such as toilets and sinks. Installation of a bathtub or standing shower in a small bathroom can effectively take up more than half the footage. The special solution offered by a wet room results from the absence of a discernible bath tub or fully enclosed shower stall, creating instead more space for bathing and maneuvering. Wet rooms can also be created on a larger scale, allowing for certain advantages such as a grander design or greater separation between bathroom fixtures and the wash area which can be placed up and away from the shower area to minimize exposure to the spray of water. If desired, water splashes can be further localized by erecting a medium height wall between the main shower area and the wet room’s fixtures. With proper installation, cleaning a wet room can be as simple as a rinse down of the entire room. Because of its contemporary design and attractive appearance, wet rooms are becoming more popular as luxury bathroom alternatives. This designation usually entails design elements that enhance the overall look and feel of the wet room by focusing on space, dimension, and aesthetic appeal. For smaller wet rooms, selecting wall and flooring materials that have bright colours and smooth textures creates a sense of openness. Shower heads are generally affixed to the wall, and adding any number of full-featured shower heads can provide a spa-like bathing experience.